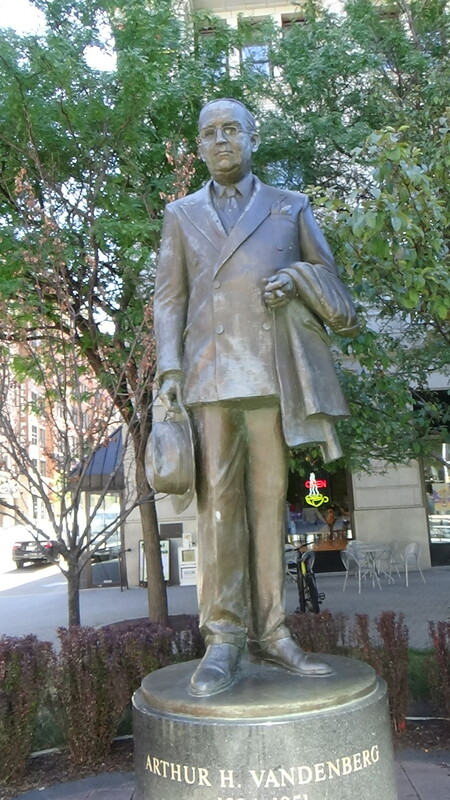 As part of our series that looks at statues, monuments and other historic markers in Grand Rapids, we look at Senator Arthur Vandenberg, who’s statue sits across from the Rosa Parks statue near the entrance to Rosa Parks circle. Arthur Vandenberg, who grew up in Grand Rapids, was the editor of the Grand Rapids Herald from 1906 – 1928. Like his boss at the newspaper, William Alden Smith, Vandenberg got involved in politics and was elected Senator in 1928. 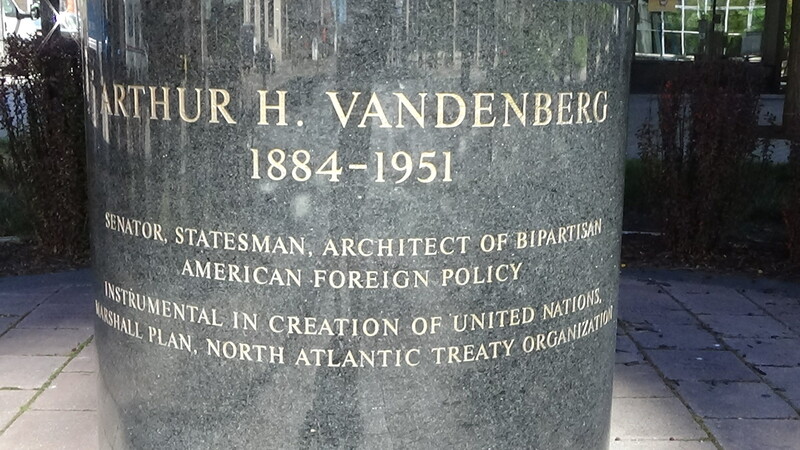 The statue near Rosa Parks Circle in Grand Rapids is inscribed with these words under Vandenberg’s name, Architect of Bi-Partisan American Foreign Policy. Such words are not only instructive, they are reflective of the dominant narrative about US foreign policy that students learn about in civics class, a narrative that is generally mimicked in commercial media. However, once the US declared war on Japan after the bombing of Pearl Harbor, Vandenberg’s isolationist views began to dissipate. As a member of the US Foreign Relations Committee, one of the most influential committees in Congress, Vandenberg began to call for the US to take an assertive role in the matters of foreign policy. Vandenberg did not live that many years after World War II (succumbing to cancer in 1951, but long enough to be part of three policy decisions that continue to dominate US foreign policy ever since. The three major policy decisions are also inscribed on the statue of Senator Vandenberg in downtown Grand Rapids. Those policy decisions were: to support the creation of the United Nations, the Marshall Plan and the North Atlantic Treaty Organization (NATO). Senator Vandenberg became a champion of the creation of the United Nations and submitted the UN charter for Senate approval in June of 1945. Earlier that year, Senator Vandenberg was a US delegate at a conference in San Francisco to discuss the formation of the United Nations. In Phyllis Bennis’s book, Calling the Shots: How Washington Dominates Today’s UN, the author makes clear that the US was not going to be part of a process that created a level playing field at the international level. US policy makers saw the creation of the United Nations as a mechanism to insert US dominance at the international level after WWII. This was exactly why the UN Charter included a Security Council, with the US being one of the permanent members and giving the country veto power. 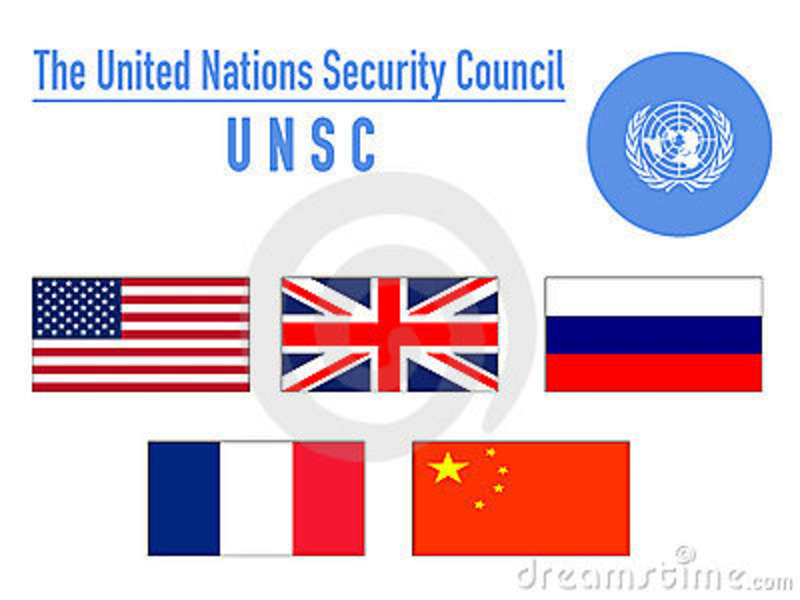 The UN Security Council was not only decided upon by the US, but other powerful nations, which also had a stake in global politics after WWII. However, the US came out as the dominant power after WWII, both economically and from a geo-political stance. Thus the notion that Senator Vandenberg was in support of global peace is a bit of a stretch, since the creation of the United Nations was fundamentally a mechanism for US hegemony. The Marshall Plan in generally communicated in popular culture as the United States commitment to helping rebuild Europe after WWII, sort of a form of US benevolence. However, what was really behind the Marshall Plan was not some great humanitarian endeavor, rather a way to solidify US economic dominance at the beginning of the Cold War. The $13 billion price tag attached to the Marshall Plan was essentially US taxpayers funding US based corporation who would “re-build” Europe, thus further solidifying US corporate control by opening up new markets throughout Europe. One example that Noam Chomsky discusses is that the Marshall Plan got Europe and Japan to shift from a coal-based energy system to an oil-based energy system. What this means is that roughly $2 billion from the Marshall Plan went straight to US-based oil companies after WWII. The CIA also skimmed large amounts of Marshall Plan funds to covertly maintain cultural institutions, journalists, and publishers, at home and abroad, for the heated and omnipresent propaganda of the Cold War; the selling of the Marshall Plan to the American public and elsewhere was entwined with fighting “the red menace”. Moreover, in its covert operations, CIA personnel at times used the Marshall Plan as cover, and one of the Plan’s chief architects, Richard Bissell, then moved to the CIA, stopping off briefly at the Ford Foundation, a long time conduit for CIA covert funds. The third major post-WWII policy that Senator Vandenberg is credited with passing was the creation of the North Atlantic Treaty Organization, also known as NATO. NATO has generally been viewed as a means to counter Soviet military influence after WWII, particularly in regards to Europe. However, as Noam Chomsky and others have observed, NATO is a US-run intervention force. Now, it must be made clear that Senator Vandenberg, like many politicians, may not have know all the details about policy decisions they make. However, let us make no mistake about the fact that the major policy decisions for which Senator Vandenberg is revered, are the ones that gave rise to US global hegemony and US Imperialism. This entry was posted in Lies Across Grand Rapids and tagged Arthur Vandenberg statue, Grand Rapids statue of Senator Vandenberg, Senator Arthur Vandenberg. Bookmark the permalink.